We are crafters of handmade Goat Milk soaps, our products are made with the finest quality ingredients to bring you a truely luxurious range of soaps to pamper protect your skin. Goat milk soap research reveals its amazing benefits, and studying the research has taken me almost by surprise to a product that is both visually appealing and incredibly helpful and beneficial for all skin types. Ongoing careful experimentation led me to blends of natural essential oils with powerful natural properties that can really help with skincare. So many people suffer with skin problems and so much of it is because we are unknowingly exposed to harsh chemicals and detergents that strip away our natural defences. The purpose of helping people has been a part of me for a very long time. I now find this little cottage industry is enormously satisfying and allows me all the benefits of a research based subject that satisfies an inquiring mind linked with a hands-on production process where control is rewarded with a consistently good product. As time goes on we are extending our range to include more innovative ways to enhance the benefit of Goat Milk soap. Our little home laboratory has now produced many wonderful and effective recipes for assisting the healing and maintenance of a balanced and healthy skin. While I have been researching the benefits of specific blends of essential oils and natural ingredients that demand great precision and patience, I do have the help and support of my consultant team if needed (My children are involved with medical research and development and love soap making). Our philosophy is simple. Pure and natural ingredients combined with a desire to produce a down to earth quality product that works. We only use the finest essential oils distilled and processed naturally from the plants. We avoid artificial fragrant oils because they are produced by a process that introduces chemicals and alcohol that can irritate the skin . 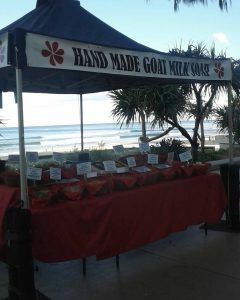 On the Gold Coast we have many great markets. We have discovered this to be a very pleasing way of getting exposure and I attend the farmers and hand craft markets regularly. People who have bought our soap return often and give us great pleasure with their complimentary remarks.